Healthcare cleaning wipers have to be tough enough to scrub up stains but soft enough for use on patients’ skin. TIDDOX's CLASSIC JUMBO ROLL is ideal for use in healthcare. It’s tough, affordable, and disposable. The Jumbo Roll is 300 meters long with 600 perforated sheets. With the JUMBO ROLL FLOOR DISPENSER, you can place these healthcare wipes in the more high-traffic areas so that they are available for your employees. These childcare wipes will gently clean pudding from a toddler’s mouth, then fully contain the mess from a leaky diaper. When used in aged care facilities, these patient wipers are easy to use for patient hygiene, but serve equally well when used with solvents to clean medical spaces. 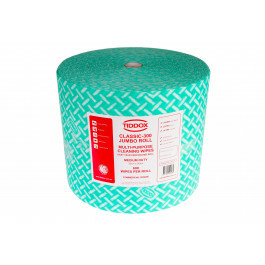 Since this is such a large roll of healthcare cleaning cloths, it is quite budget-friendly, due to the bulk packaging of 600 wipes on a single roll. This cloth is so tough that it is currently used in industry and mechanics for tough cleaning jobs. But, it is soft to the touch, so we now market it to healthcare facilities, too! Drop one of these towels on a spill and it will soak it up, retaining the fluid until you can get the cloth to the trash can. Don’t you hate it when a cloth drips all the way to the trash can? It just spreads the mess, and if someone steps in it, it gets tracked all over the place. Try our CLASSIC JUMBO ROLL! This will cut down on the mess without adding to your laundry. Other related products from TIDDOX's range of healthcare cleaning wipes are the heavy duty PREMIUM WIPES ON A ROLL and the medium duty CLASSIC WIPES ON A ROLL.